There is a new restaurant about to join the Queen Mary Road strip in Montreal. Parthenon, the popular bring your own wine brochetterie and a mainstay on Van Horne Avenue near Côte des Neiges since 1978, is opening a second location on January 3. That is not great news for Yia Sou, the three year old Greek restaurant right next door. It took over the spot previously occupied by the Arahova chain and has done very well. Parthenon has a lot of the same menu items (not of course Yia Sou's signature Greek Taverna chicken) at a much lower price. Parthenon's Côte des Neiges location is very popular at lunch, especially with the nearby Jewish General Hospital crowd. It will now attract a new West End crowd in Snowdon. Can Yia Sou and Parthenon co-exist on a strip which has traditionally not been too friendly to restaurants? We will wait and see. I am a big fan of YiaSou and although I love to try new restaurants, especially Greek, I will never step foot in Parthenon for the simple reason that they opened next door based on jealousy of YiaSou's success. Being a business man myself, this is just bad business and their motives are clear and this is why YiaSou will swallow them up. I totally agree. I've also been a client of yia sou from day one but decided to give Parthenon a try. It is in no way remotely comparable to yia sou. 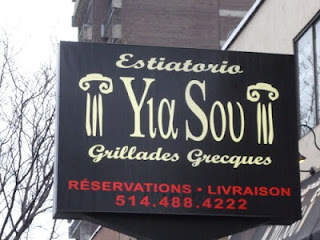 Yia Sous quality and just overall experience is far more superior to Parthenon. Even if yia sou is a bit pricier, it's well worth the money. That's great news. 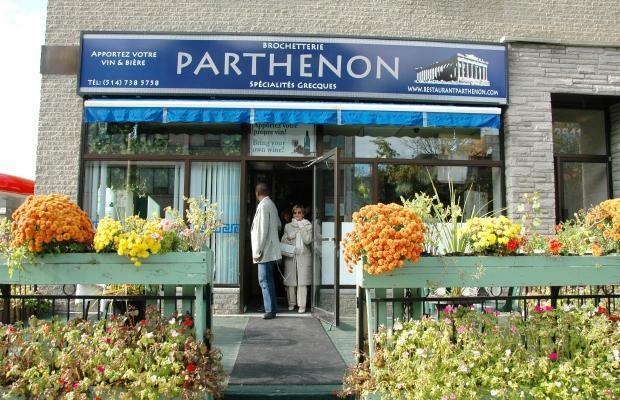 I eat at Parthenon often and they have really great food, plus its better for me cuz I live in NDG, acually its better for all the people who like their food and live in the area. I don't see any problem opening near YiaSou. Business is business and the competition produce progress, so better for the consumers. Parthenon is a on another level!! Bring your own wine, great food and amazing service...awesome overall:) I live in the area and could not be happier. The selection, hospitality, ambience and flavours of PARTHENON make you feel like you are there. If you are a fan of Greek food, then you are probably a fanatic about tzatziki. The yogurt, cucumber and garlic dip is like the Greek version of peanut butter — good on anything, including your finger. Since it opened 35 years ago, Parthenon’s tzatziki has been hailed as the best in Montreal. Creamy, thick and very garlicky, it is definitely my favourite. A generous portion, served with grilled pita bread for dipping, is a meal, although you may also want to try some of their other specialties, including souvlaki and grilled chicken. A bring your own wine and beer policy complements the reasonable prices and diverse menu. Lunch specials are available Monday to Friday. Well, that seems to be a bit of an advertorial--but accurate. Wow the owners of Parthenon are really advertising here lol. Surprised the suburban actually allows shill postings. I was in a generous mood and allowed it! Of course you did. Maybe they were in a generous mood too. I've been to both and Yia Sou is far better In quality and service. Parthenon may be cheaper but so is the quality of food. I was abit disappointed when friends and I tried to make a telephone order and they would not accept a credit card over the phone. So our order went to Yia Sou, they happily took the card. I totally agree. Yia Sou has survived in a location where at least a dozen restaurants have closed so they must be doing something right. All my friends and family visit at least once a week because their food and service is exceptional. I believe that Parthenon will be swallowed up by Yia Sou in less than a year. Yia Sou's reputation is fantastic and they seem to be getting better and better. Tried both for the first time last week. Yia Sou is far better in every sense of the word. - Wow, I could see how it easy to destroy a reputation, should be a reason for. Many of you, the real Parthenon’s customers, love Parthenon’s food and services, and they never gone change their opinion. They are happy with the NEW Parthenon’s location, it’s close to their home. But, I could see also, a lot of comments, negative comments, put in balance Parthenon and YiaSou, and suddenly Parthenon become the worst restaurant in the world. - I never saw before bad comment against Parthenon, BUT since become YiaSou's competitor, Parthenon “doesn’t have food quality”, “the service is not good” etc, etc, etc. - - “I will never step foot in Parthenon” - nobody asked you step in. - - Talking about “jealousy”, - I think you are wrong, I don’t see any reason, Parthenon to be jealous. They have their own Greek food lovers. In 35 year they won people confidence. - - “Can’t get to Greece? “ That’s me (January 22, 2013), I wrote it, and it’s just copy paste from Ottawa web site restaurants, talking about the best 5 Greek restaurants in Montreal and Parthenon are between them. I am not the owner. What’s wrong, I am not allowed to show their strong side? I am happy with their services. If you want, you could read by yourself. I never blame Yia Sou for what they are. - - “Parthenon has a very good location on Van Horne” I agree, you are right, and also Queen Mary it’s another very good location for Parthenon. - - Hi Sam, how you talk about somebody‘s intelligence, who are you, telling them, what they have to do? What are you talking about, “close” and “bankruptcy”? What you know about them? - - Nobody gone stops your friends and their family go to Yia Sou, once, twice even every week days. If you believe than Parthenon will be “swallowed” by Yia Sou, it's OK, but I don’t see the idea, why you have to say that? - - Reading your anonymous comments, I am asking myself if you are not the one, who is scary about Parthenon? I never saw bad comments coming from the Parthenon to destroy your name. Parthenon doesn't want the WAR, be the “business man”, the way you present yourself on the first comment, and just do your job. - It's time to go to eat, each one, where he likes. Bonne Appétit !!! Of course you're the owner lol. A client wouldn't copy paste a paid "review" just because he's so loyal nor would he take the time to disect every comment here lol. On the other hand, I am not the owner of yiasou but have eaten there and it is fantastic. Will try Parthenon someday but so far I haven't heard good things about either of their locations but still would like to try for myself. Second, how you could be in my mind to know what I am thinking, what could I do or not, for somebody I appreciate? I have the same question for you ?!?! Since Parthenon becomes your “competitor” you don’t stop writing all kind of bad comments against. How you could say “I haven't heard good things about” Could you keep this comment for later, once you already tried? I understand you appreciate Yia Sou, but you don’t have the right to destroy Parthenon’s reputation with some frivolous comments!!! Thank you for understanding !!! If you're not the owner of Parthenon then how do you know the review was not a paid one lol. It reaks of an over zealous advertisement. It's pretty suicidal to open another Greek restaurant on that block. It is where restaurants go to die. A lot of restaurants at Yia Sou's location had nice crowds when they first opened, but only Yia Sou has remained. They have great food and friendly service. Parthenon might grab some customers, but all that will mean is that two restaurants will go bankrupt, where one could have survived. Don't think that the 2 will go bankrupt. Yia sous reputation in the area is outstanding. It was crazy for Parthenon to open 2 doors down. Doesn't make any sense. It's not Prince Arthur. Was at yia sou last weekend and waited in line 20 minutes before being seated hence I don't think it's going anywhere. Lmao !!! Can't you really se the truth, you have one prob my friend ? ?